As part of the new Outerlink IRIS system, a full suite of software has been released to provide everything from global tracking and Push-To-Talk Radio to a user-friendly Flight Data Monitoring application. Where the IRIS system provides virtual live connection to the cockpit, the new IRIS Console gives customers a web-based software tool that displays all the detailed tracking data, along with complete aircraft system visibility. The Outerlink IRIS Console presents a virtual copy of the aircraft engine and airframe subsystem status by monitoring every caution & warning in the panel, along with streaming the geospatial movements of the aircraft. The global tracking map lets customers see each aircraft’s position and condition at a glance with simple color hues that indicate general tracking, phase of flight, and aircraft condition. With constant monitoring and pre-programmed internal and external event triggers, the console immediately alerts customers and, if desired, can notify key management through email or SMS messages. 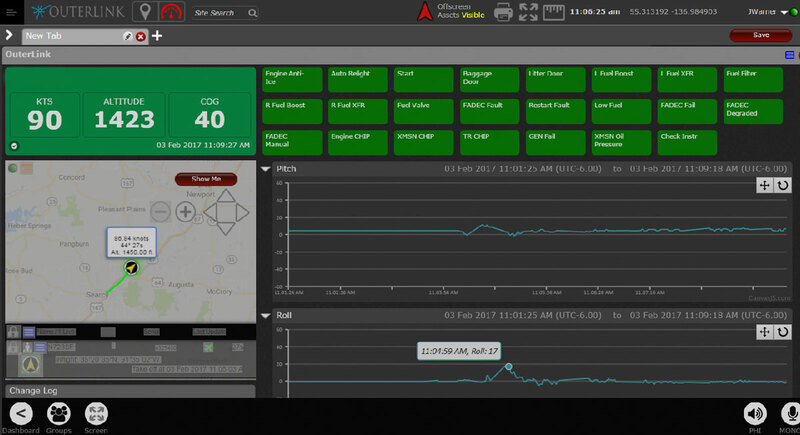 The IRIS system delivers data that operators need to make quick decisions and keep a pulse on what is happening within their entire fleet. With its open architecture, the IRIS Console software suite gives operators the latest communication and system monitoring technology with just one installation. “The safety aspect that IRIS introduces to an operation is invaluable,” said Outerlink Director of Sales and Marketing Jeff Warner. “Having the ability to monitor all the aircraft systems live, coupled with the capability to push a button and talk to your entire fleet, gives an operator that extra level of safety and efficiency that has not been available until now.” Pilots and crew can communicate via talk groups using push-to-talk technology, making communication amongst the fleet easier than ever. IRIS is compatible with a full range of helicopters, from older analog models to the newest on the market. Even with a mixed fleet, the IRIS solution provides an integrated monitoring and communications system for operators. In addition, IRIS meets all aspects of the FAA 135.607 HEMS ruling. The IRIS system will be on display during HELI-EXPO 2017 in Dallas. Operators can get an in-depth look at its features at the Metro Aviation and Outerlink display, Booth #9342, or learn more at Outerlink.com.